Ray Ban prescription glasses and sunglasses frames at unbeatable prices. 100% genuine. See our round eyeglass frames collection. Cheap glasses good quality! Great for backups, fashion or occasional use prescription glasses while meeting all FDA and ANSI standards. 100% authentic brand name eyewear, made by well-known designers worldwide, and adheres to high quality of materials and comfort. The most popular frame shape for Women and Unisex. Great as prescription sunglasses and all day use. The best eyeglasses quality, handpicked by our optical staff. These premium eyewear frames made from higher end materials and finishes that are more durable and comfortable. Congratulations! You have just made the first step to choose your next pair of eyeglasses online. Rest assured that here at Overnight Glasses we have your back, with over 250 combined years of optical experience, all focusing on your needs. Our goal is to give you the best, most advanced pair of high quality prescription eyeglasses, by using the best eyeglass frames, lenses materials, coatings and manufacturing equipment. 1. You can order eyeglasses from the comfort of your home or workplace at any time of the day. 2. View a huge variety of eyeglass frames at wholesale prices and pick the pair of eyeglasses that best fit your needs, without compromise. 3. Your wellbeing and needs are our highest concern. We only pick and display the highest grade of products, and unlike many companies today, we will not be swayed to change this regardless of the gain. 4. You get the most advanced lens designs. 5. Unlike your insurance company, there are no limitations on materials or frame quality, and you get the best price for every eyewear and lens product you see. 6. Experienced certified opticians will help you select prescription eyewear and lenses that will best fit you and your needs. 7. We can deliver your new eyeglasses within 24 hours of the time you place your order. Get the best eyeglasses in record-breaking times! Overnight Glasses manufactures eyeglasses in the United States using prescription lenses and frames that are approved by the FDA, and tested according to CFR standards. Our staff compiled from certified opticians that will triple verify your prescription eyeglasses. First, before production, we check for lens quality and eyeglass frame integrity. Second, post-production, we check for prescription correctness and frame alignment. Finally, we recheck prescription accuracy and pack your order to perfection. Need help ordering? You got it! Our highly experienced customer service team has already dispensed thousands of prescription eyeglasses and is available to answer any of your questions. We will assist you to choose the best eyeglass frame fitting your physique and lifestyle, as well as the best choice of prescription lenses and coatings such as scratch resistant, Anti-Reflective and UV protection that will enhance the performance of your eyeglasses. Our goal is to make buying eyeglasses online as easy and pleasant as possible. Simply email or call us - satisfaction guaranteed. Email: [email protected], Tel: 855-830-3339 (Monday-Friday, 9:30am-6:00pm PST). Before ordering eyeglasses online you need to obtain your prescription information. You may take a new eye exam or - if you already taken one this year - your eye doctor will have a recent copy on file and can give it to you upon request. Please verify that your prescription information is current and has not expired (over one year since your last eye exam). I am missing my pupillary distance! 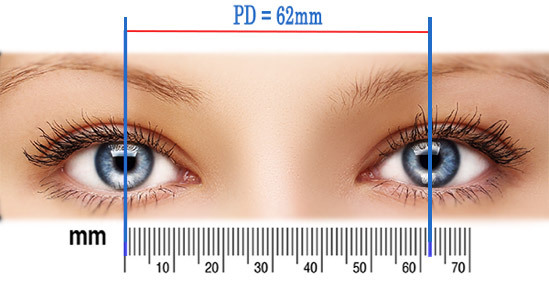 In some cases your eye care practitioner will omit your pupillary distance (also known as PD) from your prescription. This is part of your prescription and you need it in order to purchase prescription eyeglasses either in-store or online. Your eye care practitioner needs to provide it when conducting your eye exams. Because our staff members are certified opticians, we can call your eye care practitioner and obtain a recent copy and any missing RX information we deem necessary to manufacture your new prescription lenses. If it is not possible to receive your PD values from your eye doctor, you may measure your own PD by following this guide. Find your perfect frame or simply send us your own frame to get new prescription lenses. Finding the perfect eyeglass frame online is the first and most important step. Your eyeglass frames need to sit properly on your face and should not pinch your temples or slide from your nose. If you already have a pair of prescription eyeglasses that are just perfect for you, you can see the size, which is usually located on the temples (arms) or back of the bridge. Frames sizes are measured in millimeters and usually appear in a ##-##- ###- format. The first number is the lens width, the second the bridge width and the third is a measurement of the arm lengths. 1. The eye size of eyeglasses frames is the measurement of the inserted (cut) lens size, measured between the furthest edges, in the same way we size TV screens. The eye size measurement is a significant factor to overall frame width. 2. Bridge size is the measurement of the empty space between the left and right lens cubicles. This size determines how well the lenses position in front of your eyes: too small will cause the eyeglasses to ride too high and will create unpleasant pressure on your nose. Too big, and your eyeglasses ride too low, creating unpleasant pressure on one of the most sensitive parts of our face. 3. Arm length is the measurement of the temple arm and is important for correct lens positioning. Short arms will pull back the lenses uncomfortably close to the eyes, and in some cases will alter the angle of the lenses relative to the eye. When the arms are too long, eyeglasses are too loose and you may feel like they sliding off your face at all times. Ship us your eyeglass frame for lenses replacement. In case your eyeglasses still have life left in them, you can send us your frame and we will replace your old prescription lenses with new ones. Upon receipt of your frame, our opticians will survey it and make sure we can still insert new lenses. If this is your first time buying eyeglasses, we recommend to first measure a few pairs of frames at a brick and mortar store. This will help you understand your correct size and shape of your required eyeglasses frame. The second step for choosing the right frame is to pick a shape that complement your face. In general, the more angular your facial features, the rounder the eyewear frame should be and the rounder your facial features, the more angular the eyewear frame should be. For this, we have provided this simple guide. Many shapes of eyeglasses frames deliver different statements depending on our mood and outfits on that particular day. At Overnight Glasses, we have solved this issue by making quality eyeglasses affordable. You are free from being anchored to one pair of eyeglasses and trying to fit your daily outfit to it. Instead, you can own many eyeglasses, in different shapes, colors and styles that are sure to project the right impression when you need it. High quality eyewear does not need to cost hundreds of dollars. This is a fact here at Overnight Glasses, but how do you know the frames are high quality? We simply do the hard lifting for you and select eyewear brands that are not just for show. Each frame displayed passed all required FDA tests and ANSI standards that are only done for prescription eyewear sold in the USA. Rest assured that when you buy a brand name designer eyeglasses on our site, it is guaranteed to be 100% authentic. By purchasing large volumes and overstocks, we are able to projects these deals back at you, saving you hundreds of dollars when you buy designer eyeglasses from Ray-Ban, Prada, Oakley, coach, Gucci, and many more. Lens quality is a must if you want great vision, and is something to keep in mind when buying prescription lenses online. Not all lens materials are pure and the market is flooded with B and even C grade prescription lenses that are sold to unaware consumers. Micro fractures in the coatings and distortions may cause headaches, dry or strained eyes and in some cases can even deteriorate your prescription needs. These are very hard to spot, and it is the reason we only purchase our lenses from reputable sources. Lenses by SEIKO, Shamir, Younger Optics, Varilux (Essilor) and more go through rigorous lab testing to bring you the absolutely best quality, 100% guaranteed! Because each of us has different prescription needs, each lens must be tailored for perfect correction. Buy prescription lenses at ease for single vision, bifocal, tri-focal, and progressive lenses knowing you always get a thin, ultra-clear and aesthetically beautiful eyeglasses. 1.50, also known as CR-39, is manufactured by PPG industries, known to provide the purest resin. You may need this material if you require light correction for prescriptions up to +/-2.00 combined (the absolute value of your SPH and CYL combined). This is also the most common and least expensive lens material. Polycarbonate, also known as PC is an impact resistant and lightweight material used to correct prescriptions for up to +/-6.00 combined. Because of its high-impact resistance and relatively lower price, Polycarbonate is recommended for children, athletes and for any other active wearers. 1.60, also known as MR8, is a high index lens material meant to correct prescriptions of up to +/-7.00 combined. MR8 is the purest version of 1.60, a fact that many eye care providers are unware of, giving their patients a material that looks thin, but will not bend light properly and create distortions. 1.67 MR7 / MR10 is a high index lens material meant to correct prescriptions of up to +/-9.00 combined. MR7 has better impact properties while MR10 will have better optical properties but these differences are extremely minimal and the decision to use one or the other is based on the frame picked. For example, for a rimless eyeglass frame we will use an MR7, while a full rim eyeglass frame requires an MR10. Have an extremely high prescription? Bring it on! 1.74 Ultra high index will correct for prescription of over +/-9 .25 combined. Overnight Glasses is proud to be the first online retailer to offer super thin lenses for patients who need it the most. Trivex High-Definition Lenses are the clearest, lightest, and toughest lenses in the world that even surpass polycarbonate in all impact and chemical resistance tests. Water-white, patented material, designed for the military and mainly used in protective windshields such as the ones used in aircrafts and vehicles to create an ultra-clear, bullet proof window. Trivex lenses are meant to correct prescriptions of up to +/- 4.00 combined because of the relatively low index of 1.53. Highly recommended to everyone, and especially for professional sportsman who require high precision optics. All our packaged items include UV protection, scratch resistance, premium anti-reflective and easy clean coatings, free of charge. You can also upgrade your eyeglass lenses to our ultra-premium coatings, only available at our store. Turn any eyeglasses to prescription sunglasses for any condition and occasion. Using the best polarized, Transitions™ and tinted lenses, you can rest assured your eyes are protected from the sun and glare. "I have purchased 3 pairs of glass from overnight and their work and service is excellent. I would recommend everyone to try them for yourselves"
"I lost my prescription eyeglasses while on a 2wk. business travel to NOLA. My eyes struggled at work & I couldn't enjoy the city at night. I searched online & found OG, read the reviews, saw the selections, read the process/policy...& thought--game changer! I sent in my info Mon. evening by Wed. afternoon I was wearing my new eyeglasses. Received it in a secure package w/tracking, nice OG case & cloth, felt like Xmas! Glasses looked * fit perfect, better than my original.Thank You OG. My trip was successful, I enjoyed beautiful NOLA, and i was able to visit family in MS. #Grateful"
"Easy to order, fast shipping, great selection, not expensive at all and prescription was perfect! Will be using this site for all my future eyewear needs." "I received my eyeglasses the very next day and they were perfect. I have been telling all my friends and family about over night eyeglasses and I will be ordering all of our eyeglasses from you leading forward!! Happy customer!!" "I was a little skeptical at first because it was my first time ordering eyeglasses online, but the price was awesome, the eyeglasses were exactly what they were supposed to be, and I couldn’t be happier with my purchase. Not to mention, the great deals AND coupon codes on top of these awesome prices!" "Very happy with the 2 sets of of lenses in my frames. Crystal clear vision. Will buy again, fast service."